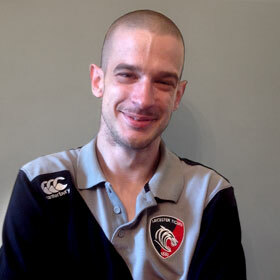 Matt is an important member of our Leicester Tigers Wheelchair rugby team and we were delighted to support him with a suitable chair to allow him to play the game that he believes has set him back on the right path. Matt has explained in his own words his journey and is another wonderful example of someone who has chosen to Get Busy Living. It's hard to put a name to my disability. As a baby of 8 months old, one night in my cot I had a fit. The doctor was called, he gave me an injection, and rushed me to hospital. I was ill for a few months and as a result was paralysed from my waist down, have deformity to my hands, and was unable to control my toileting. My family first encouraged me to crawl, and I would literally drag myself around with my arms. As I grew, I was able to use first walking frames and eventually crutches. I can stand a little holding a wall or piece of furniture, but couldn't walk across a rugby pitch unaided for example. I fought to be allowed to go to mainstream school with the friends I'd grown up with, and played sports as much as possible playing in goal on the football pitch on my crutches, playing basketball and badminton in the worst wheelchair imaginable, some table tennis and regular swimming. However, as my able bodied friends grew older I found I was able to compete less and had to obviously pass on trying out for any of the teams, and as I was the only guy in a wheelchair, it was tricky to set anything up. Since I left school I worked until I was in my late 20's for Tesco, BT, as an IT Technician at a school, and at Orderwise Software amongst others, I went to music college and write dance music/and DJ. But I made bad decisions, hung round with the wrong crowd, and ended up in a dark place with no job, no money and major depression. My body had become weak, I was becoming ill and was embarrassed of myself and how I had let myself slip. When all seemed lost and hopeless after a few years of hell, I watched the Paralympics, and in particular, wheelchair rugby. I knew when I saw it I had to get involved. I contacted the Marauders and joined them. I also moved from Lincoln centre to a quiet village away from the bad crowd and turned my back on all of my past. I've joined a gym and visit nearly every day when not at training for 40 minutes on hand cycles, weights, and a swim. I've changed my diet cutting out bad food, beer and Red Bulls, and making sure I eat the right things at the right times, with protein supplements etc. It's been hard getting the money for petrol from Lincoln, it's hard affording anything while on benefits and in debt, but I've managed to budget and get myself there every training session this year. Rugby has saved my life. It means everything to me, I want to compete and want to succeed and am willing to work hard and do whatever it takes to make that happen, and give everything I can to the Tigers.